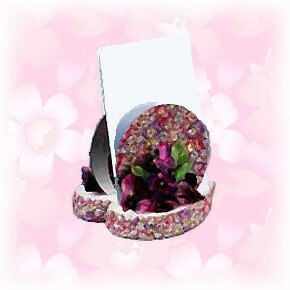 Mom’s CD or DVD letter holder is made 3 or 4 cds or dvds, a styrofoam heart shape and a small amount of fabric. Reuse three or four old CD’s or scratched DVD’s and make Mom a lovely letter or note holder for Mother’s Day. 1. Cut three or four 5-1/2″ squares from fabric. For each CD, spread thin layer of white glue over label side and smooth a fabric square over glue; let dry and trim excess. 2. Cut two 1-1/2″ x 12″ strips from fabric. Glue fabric strips around edge of foam heart, overlapping as needed. Clip corners and fold excess fabric to bottom; glue to secure. Note: If desired, trace heart onto wrong side of fabric and cut out; glue to bottom of heart. 3. To make inserting discs easier, first cut 3/8″-deep, equally-spaced parallel grooves into top of foam heart. Cut straight down, not at an angle. Apply thin line of white glue along each CD slit and press discs 1/2″ to 3/4″ deep into slit. 4. Glue silk flower bunch to each side of discs as shown.